This unusual structure is the brainchild of Lek Viriyapant who had a vision of preserving his personal collection of Thai art for posterity. He pursued this by retaining Buddhist and other relics within the country to foster cultural tourism with the most unusual architecture. Construction of the museum started in 1994 and was only completed in the early 2000s. 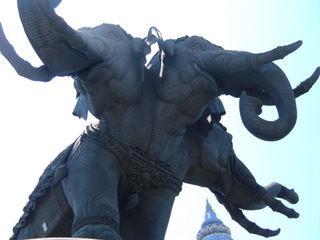 The centerpiece, of course, was the 250 ton three-headed elephant called Erawan to be hoisted on the domed roof. What is the allure of Erawan? The architecture of the Erawan Museum and the sections within the building were designed to represent Hindu mythology on the structure and characteristics of the universe; representing the Three Worlds. Housed in the basement of the Erawan Museum, the underworld contains a fine collection of Chinese vases in the Ming and Qing dynasties, the famous Sangkhalok pottery from Sukhothai, Benjarong ceramics and Chakri tea sets. Other antiques there include old chairs and cabinets from the early Rattanakosin period and a Shiva statue in Khmer design from the Angkor Wat period. Earth or the human world represented by the main hall above featured more displays of ceramics, neilloware and jade as well as Western pottery. The Viennese and Victorian vases looked rather out of place in this setting. Craftsmen were still working on the designs on one of the pillars in the hall. 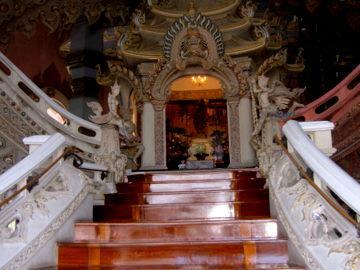 Two staircases studded with porcelain wind upstairs on either side of the hall, virtually the stairways to heaven, passing the altar of Kuan Yin, the Goddess of Mercy, on the way up. High above the main hall, the stained glass ceiling beneath the dome is etched with a map of the world, the stars and the zodiac symbols. In Hindu mythology, Mount Meru, the center of the universe, is located somewhere in the Himalayas, high above Earth. At the apex of Mount Meru is Tavatisma where Indra astride Erawan rules over 33 gods. We were taken up to Tavatimsa inside the giant elephant above the dome of the building. The focal point of the Erawan Museum is the gigantic three-headed Erawan, 29 m high, 39 m long, 12 m wide and weighing 250 tons! The elephant is hollow, lightning conductors run through the four legs, the left rear leg houses the lift, the right rear leg a spiral staircase and the tail the fire escape! A small window in the elephant's belly gives an aerial eye view of the museum grounds. It took a long and dizzy walk up the spiral staircase housed in the elephant's right rear leg to a floor on the upper section of the elephant which houses some of the oldest Buddha statues in Thailand. Symbolically, this is Tavatisma, where the gods reside. The sculptures, from the various eras, are comparable to those found in the Museum of Buddhist Art andthe National Museum; Dvaravati 8th – 9th C, Loburi 12th – 13th C , Ayuthaya 15th – 16th C, Lanna 16th C and early Rattakosin 19th C.
The Loburi sculpture, the only one in wood, is already showing signs of cracks and stains of age. The rest are in bronze or sandstone. Outside the main building worshippers pray before an altar with smaller versions of Erawan while others float off lotus flowers on a pond by the well-kept garden. 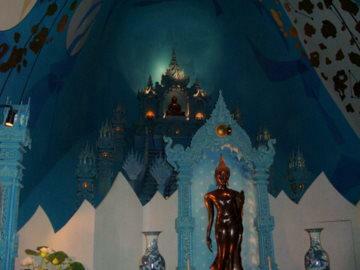 The Erawan Museum is also a place of worship for the Thais. 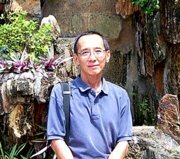 The Ancient City or Muang Boran further down the road and the Sanctuary of Truth in Pattaya are similar creations by the same man, Khun Lek Viriyapant; present day efforts to recreate lost culture and traditions and to preserve them for posterity. To the casual visitor, the museum with the three-headed elephant may appear garish or gaudy at first glance. But if we are to reexamine the objectives of the museum which are to preserve and retain Thai art and culture on Thai soil as a heritage for subsequent generations in a structure that symbolizes the Thai cosmos, its purpose is fulfilled. The Erawan Museum has to be seen in this light. The museum in Sukhumvit Road as it leads out of Bangkok city into Samut Prakarn province. The city limits are at Soi Sukhumvit 107 (Soi Bearing). 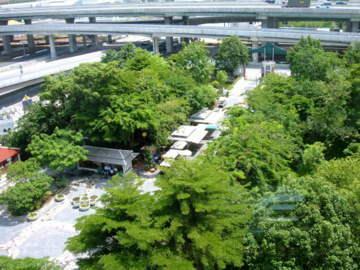 Two air-conditioned bus services from the city pass this stretch of Sukhumvit Road. Or you can take a skytrain to the E14 Bearing station and take a taxi to the museum. 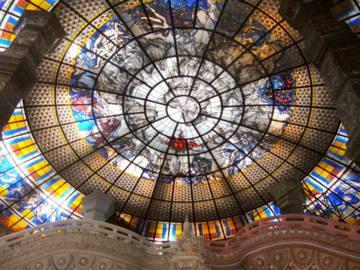 The Erawan Museum is open to visitors every day from 0800 – 1700 hours.